I was driving on Highway 15 and passed a police car sitting on the side of the road and I was doing the speed limit. I checked my mirror and he did not pull out…but then a couple of minutes later I did see him in my rearview mirror. He continued to follow me for about 2 miles. He finally pulled me over and asked me that stupid question “do you know why you were pulled over”. I said no and he told me my registration had expired (my tags were old). He proceeded to call in and did find out that I had paid for my new tags and that I just never received them in the mail. Go to DMV and wait about an hour to get my new tags. Now unless you are from another planet you know that going to the DMV is not fun. Next I had to drive about 20 minutes to have a CHP witness that I did receive new tags and they were on my car. I chose to go to CHP because if you go to your local police department you have to pay $15 for their eyesight…the CHP’s eyesight is free! Next I had to go to the municipal courts to show that the CHP did sign off on my ticket and then I had to pay a $25 fee. (oh, and when you pay the fee, the clerk is on an elevated platform like a pharmacist…is this some way to make them feel superior to us). 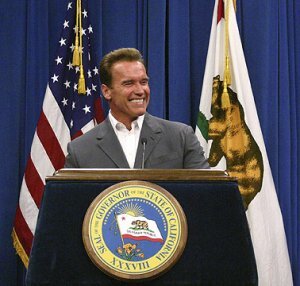 This is where I believe the scam comes in…the DMV is told my Mr. Arnold Schwarzenegger to only mail out about half the registration tags so the other half get “lost” in the mail. Then the cops look out for those cars and give them tickets. Each ticket they give out could either be $40 (if you pay for eyesight) or a definite $25. With all the people there are in CA this could get us out of the red and into the black! I did nothing wrong and yet was fined $25.00 (not to mention time and money spent on gas). They think they can put one over on me…I know what they are up to. Spend my $25 wisely Mr. Schwarzenegger.